Perhaps this is a better image. 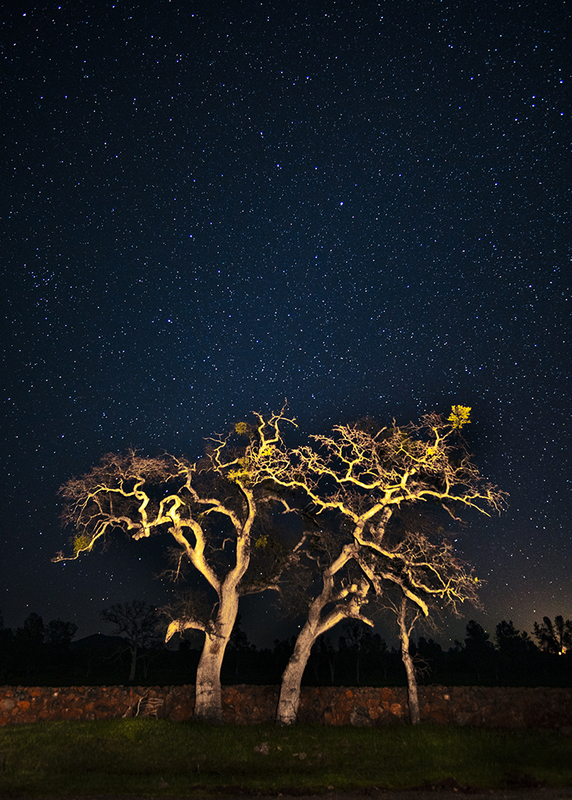 The bright trees from my light painting makes it difficult to bring out the stars. Back to the drawing board I think. Michael I do a lot of this type of image here in Australia. I do light painting on all my images but I use a tripod and take a general shot for the stars and background first focused to infinity on the stars. Then I take several more shots without moving the camera but I adjust focus to the trees in your case and increase the f stop to 5.6 and lower the ISO to 500. I have the white balance set to 3500 Kelvin. I use a torch which I gel with orange to paint the main object. Always light from the sides and never from the direction of the camera. After processing raw files I combine the layers in photoshop using a blend mode of 'Lighten' and apply a layer mask to each image to mask out the sky from all images but the original background layer of the stars that should be the bottom layer. Try to create shadows with your light painting for a more natural look. All in all a good effort with you two images. I will post one of my images so you can see if it is what you are after. Please see my comments on yesterday's version of this. Great advice. Thanks. I've had very limited success so far in light painting but it's challenging. The trees in this version are definitly too bright.